First up is the E.L.F. Studio Matte Lip Colour in the shade Natural. To be honest, I bought this on one of my first elf orders, before they closed down and reopened the site here in the UK! So it may be a little old... but we'll skip pass that! I love everything about this lipstick. The shade is a gorgeous natural pink shade, that honestly is perfect for my lips. The formula is brilliant too! It's a matte formula, but it isn't stiff. It applies really creamy and stays place throughout most of the day. I honestly would recommend this lipstick for this time of year because you really can't go wrong with it! Next up is a product that I have been pairing with the E.L.F. product. It's a lip gloss from Colourworks. It doesn't have a shade name but it's just a really pretty light pink shade that has a little shimmer to it. I love this over the E.L.F. lipstick because it just adds something else. I don't like wearing it all of the time, because sometimes it can get a little sticky after a while and it can be a little hard to maintain throughout the day. But overall this is a really nice lip gloss that can help just add a little something more to a summer makeup look! Although I do love my colourful lipsticks, I think summer is the one season for me where I prefer the nudes. The next lipstick is one that I received in a Look Incredible box a few months back. The lipstick from Coloured Raine is a pink toned brown. This lipstick actually brought me into the love of brown tones lipsticks. Before this, I never would have thought that brown lipstick would suit my pale skin, but it actually makes my lips look bolder and really compliments my skin tone! The shade I have is Mars, even though there were a few different shades that you could have received in the box. I haven't tried any of their other shades but the formula for this one is beautiful. It dries matte, but still stays moisturising. I can wear this all day without having to reapply, even after eating. So it's great for easy maintenance if you have a busy day! 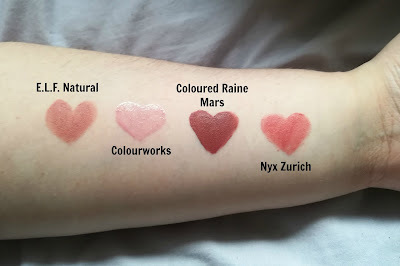 Last is my Nyx Lip Crème in Zurich. It's a lovely natural my-lips-but-better shade and is great for those days you just want to tone it down. It is really smooth and although the longevity isn't as good as some of my other liquid lip products, it lasts long enough to not become a hassle, it fades gradually as well, which is always better than a patchy mess! So those are my favourite lip colours for the summer time! Have you got any of these colours? What are your favourite lipsticks for summer? Let me know!